Mr. Kallisti just spent the past few hours sawing holes for windows/doors in la Casa Formica in the heat. A moment of silence for his efforts………. K. We rushed out and bought the most useful Barbie playset ever yesterday. The My Scene Masquerade Party Loft. No part of this contraption will be wasted. We are sawing it to bits, and repainting where necessary to incorporate into mi casa. 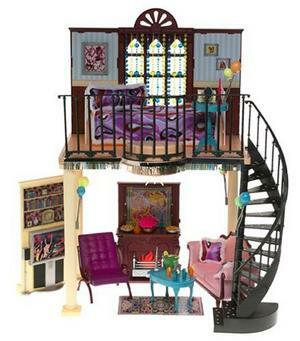 The pink froofy settee, the fireplace, the gothic windows and the spiral staircase are my favorites. 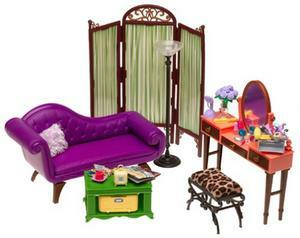 2nd coolest My Scene playset, “Chelsea’s Getting Ready” or whatever. Went to Michael’s Friday and grabbed a buncha art papers and paint for wallpaper and finishes. Even one set of papers that looks like a stone floor. And tiny pots and stuff to make topiaries. And a whole buncha crap I’m sure will be useful. Also, found a velvet-elvis greeting card that will fit perfectly in the bathroom. I still need a scale toilet. Oh, and thanks to Angrybutter telling me what it was called, I *finally* tracked down the Barbie “secret messages” playset on eBay that has the little iMacs, woo! Should be arriving any second now. I had an iMac and I miss it SO MUCH. You going to have enough dolls to populate that thing? And I *do* have enough dolls… most of them prolly won’t fit. The two Blythe’s will take up an entire floor cuz of their big heads. Heh. But the girls (and soon one goh guy, lucky man) will prolly take turns populating it. There’s a lot of work to do though, eeek! If i remember correctly… there was a leg lamp already made. it was in a package with the ‘old man’ figurene. maybe check on ebay for it? Awww… it does! I just checked e-bay. Well, that takes the fun out of making that! Do you have any EB Beauty spare hands you could place on eBay? I need a beauty white, if you don’t have a pair at least the right hand. I need one that hasn’t been sanded, painted, or customized in any way. i just love the loft apartment for the my scene girls. i want to pick it up as soon as it becomes available at the toys r us here. i want to make a few photo stories and that stair case fits the bill! Next Next post: I am so going to be the crazy halloween lady who lives down the street.